Bessie Bourland, 101, passed away peacefully Wednesday, February 6, 2019, at Green Acres Assisted Living. Her funeral will be celebrated at 11 a.m. February 15, at Charles R. Lux Family Funeral Home with Pastor Jeremy Selvidge officiating. Interment will be in Memorial Gardens Cemetery. The family will receive friends one hour prior to the service. 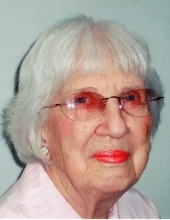 Bessie was born January 26, 1918, in Blissfield, Michigan, daughter of the late Harry and Emma (Wotring) Reed. A graduate Blissfield High School, Bessie married James Bourland in 1936 in Shepherd. She and Jim owned and operated Bourland T.V. and Appliance. She later worked at the Mt. Pleasant Center as an LPN and later as a data processor. Other jobs that Bessie held were bus driving (as the first female bus driver in Isabella County) and private nursing. Bessie was a past member of Zonta and the Child Study Club. She also belonged to the State Employees Retirement Association and was a life member of the Ladies Auxiliary at McLaren Central Michigan. In addition to her busy life, Bessie was very active with her family and grandchildren whom will miss her dearly. Bessie is survived by four children, Sharron Bourland of La Mesa, CA, Joann Lyon of Gladwin, James (Beverly Bourland of Rosebush, and Joyce (Bill) Theisen of Mt. Pleasant; seven grandchildren; 14 great grandchildren; and numerous nieces and nephews. She was preceded in death by her parents; son in-law, Bruce Lyon; and four siblings, Adah Johnson, Woodrow Reed, Archie Reed, and Charles Reed. To send flowers or a remembrance gift to the family of Bessie M. Bourland, please visit our Tribute Store. "Email Address" would like to share the life celebration of Bessie M. Bourland. Click on the "link" to go to share a favorite memory or leave a condolence message for the family.